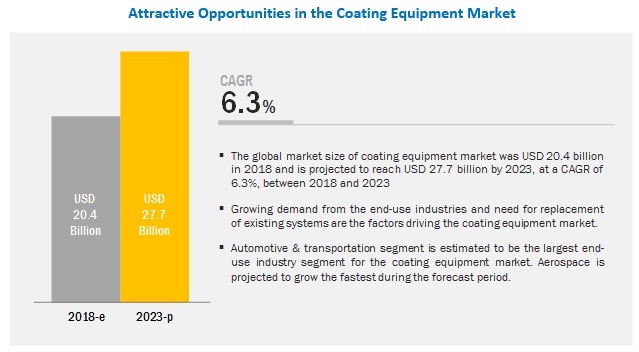 [137 Pages Report] The market size for coating equipment is projected to grow from USD 20.4 billion in 2018 to more than 27.7 billion by 2023, at a CAGR of 6.3%. Increasing demand from end-use industries and the need for replacement of existing coating systems are the driving factor for the coating equipment market. The specialty coating equipment segment accounted for the largest share of the market. Specialty coating equipment is used to apply specialty coatings. Specialty coating equipment includes PVD and CVD equipment, and thermal sprays, among others. In the emerging countries of APAC and the Middle East & Africa, the demand for this equipment is rising due to the increasing requirement for long-lasting protective coating in various applications. Aerospace is projected to be the fastest-growing application of coating equipment during the forecast period. The aerospace end-use industry is projected to register the fastest-growth during the forecast period. Strong growth of the aerospace industry and development of new aerospace coatings are the factors boosting the growth of the coating equipment market in this segment. APAC is estimated to account for the largest market share during the forecast period. APAC is projected to be the fastest-growing coating equipment market. High population growth, industrial development, increase in demand for automobiles, and growing demand for coatings with better efficiency in the region is driving the coating equipment market. The market in the region is witnessing significant growth due to the presence of growing economies such as India, China, and ASEAN countries such as Thailand and Indonesia. The leading players in the coating equipment market are Nordson Corp (US), IHI Corp (Japan), OC Oerlikon (Switzerland), SATA (Germany), Graco (US), ANEST IWATA (JAPAN), ASAHI Sunac Corp. (Japan), J. Wagner (Germany), Carlisle Companies (US), and WIWA Wilhelm Wagner (Germany). The industrial coating segment of Nordson Corporation had net sales of USD 253.3 million in 2017, which is a marginal increase from the previous year. Liquid coating, powder coating, UV curing, and container coating products drive the growth of this business segment. The company has adopted strategies such as new product launches and agreements to expand its production lines and customer base. The company’s strategy is focused on innovation and growing its customer base with excellence in business practices. The company has a stronghold in the liquid and powder coating equipment business. In September 2018, Oerlikon Balzers opened its second production center in Ve¾ká Ida, Slovakia. The new plant made Ve¾ká Ida, the most important site for coating and heat treating of automotive components. In May 2018, Ionbond, a subsidiary of IHI Corporation, expanded its coating capacity at its coating service center in France. This expansion will allow the site to continue developing coatings for cutting tools. The expanded capacity uses coating machines manufactured by IHI Hauzer Techno Coating B.V.
What are the global trends in demand for coating equipment? Will the market witness an increase or decline in demand in the coming years? What is the estimated demand for the different types of coating equipment? What were the revenue pockets for the coating equipment market in 2017? What are the different end-use industries of coating equipment? Who are the major coating equipment manufacturers globally? The study involved four significant activities for estimating the current market size of coating equipment. Exhaustive secondary research was done to collect information on coating equipment. The next step was to validate these findings, assumptions, and sizing with industry experts across the value chain through primary research. Both top-down and bottom-up approaches were employed to estimate the overall market size. Thereafter, market breakdown and data triangulation procedures were used to estimate the market size of segments and subsegments. In the secondary research process, various secondary sources such as Hoovers and Bloomberg BusinessWeek have been referred to for identifying and collecting information for this study. These secondary sources included annual reports, press releases & investor presentations of companies; white papers; certified publications; articles by recognized authors; magazines;; regulatory bodies; trade directories; and databases. 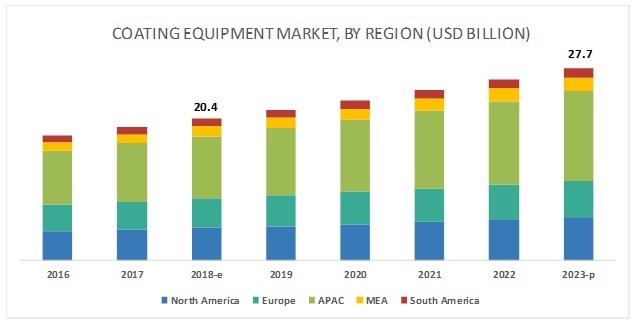 The coating equipment market comprises several stakeholders such as raw material suppliers, processors, end-product manufacturers, and regulatory organizations in the supply chain. The supply side is marked by advancements in technology for complex specifications. Various primary sources from both the supply and demand sides of the market were interviewed to obtain qualitative and quantitative information. The key players in the industry are identified through extensive secondary research. The supply chain of the industry and market size, in terms of value, are determined through primary and secondary research. Percentage shares are determined using secondary sources and verified through primary sources. All possible parameters that affect the markets covered in this research study are accounted for, viewed in extensive detail, verified through primary research, and analyzed to obtain the final quantitative and qualitative data. The research includes the study of reports, reviews, and newsletters of key industry players, along with extensive interviews with key officials such as directors and marketing executives. After arriving at the total market size through the estimation process explained above, the overall market was split into several segments and subsegments. The data triangulation was used, wherever applicable, to complete the overall market size estimation process and arrive at the exact statistics for all segments and subsegments. The data was triangulated by studying various factors and trends from both the demand and supply sides. In addition, the market size was validated by using both the top-down and bottom-up approaches. Then, it was verified through primary interviews. Hence, for every data segment, there were three sources-the top-down approach, the bottom-up approach, and expert interviews. The data was assumed to be correct when the values arrived at from the three sources matched. Nordson Corp. (US), IHI Corp (Japan), OC Oerlikon (Switzerland), SATA (Germany), Graco (US), ANEST IWATA (JAPAN), ASAHI Sunac Corp (Japan), J. Wagner (Germany), Carlisle Companies (US), and WIWA Wilhelm Wagner (Germany). This research report categorizes the global coating equipment market on the basis of end-use industry, type, and region.